Sterling Chase Realty is known for its exceptional, discreet personal services which are designed exclusively for buyers and sellers of high-end real estate. Our outstanding reputation ensures that each transaction is handled with discretion and assures our select clientele of their privacy and confidentiality. With demanding schedules, we understand that the home shopping process can become frustrating. You're in good hands, Shawan Pettigrew Broker/CEO of Sterling Chase Realty will arrange a private consultation to meet with you or your agent a to uncover the specific need of the type of housing you desire. Once a "short list" is created, discreet showing appointments will be arranged to preview these select properties. To personally meet with Shawan you can contact her directly at (352) 478-4300. Below are some of the more popular homes for sale that our Celebrity clientele draws attention to. Here you can search Celebrity Homes for Sale in Florida. Find Real Estate for Professional Athletes, Entertainers, Movie Stars, Politicians & more! 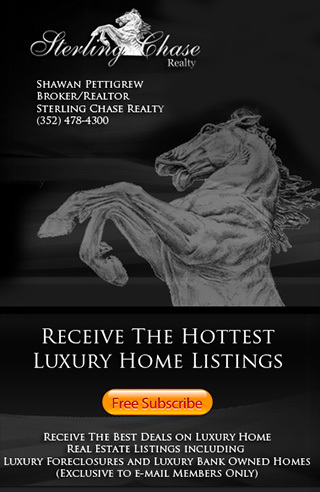 Sterling Chase Realty provides Luxury Real Estate Services in Central Florida. Our website is designed to "Showcase" Central Florida's Finest Homes for Sale and Luxury Real Estate Listings. If you would like more information about a certain home or community, feel free to call us at (352) 360-3994 7 days a week.